Having stealthily formed a bottom, the dollar’s chart looks like May-July 2008, just before it blasted off. The obituaries on the dollar are flying fast and furious, but they are premature. Astute reader Robert L. asked for my views on the dollar losing its coveted reserve status in pricing global commodities. It seems to me there is plenty of sound and fury being expended on wild speculations about secret meetings and the looming demise of the once-mighty dollar but precious little illumination. Rather than focus on "maybe’s," let’s look at a chart of the dollar from the point of view of basic technical analysis. Charts have the distinct advantage of not even pretending to reflect the fundamentals--whatever they might be. Notice how the chart in March-July 2008 looks eerily similar to the last few months in the dollar chart. 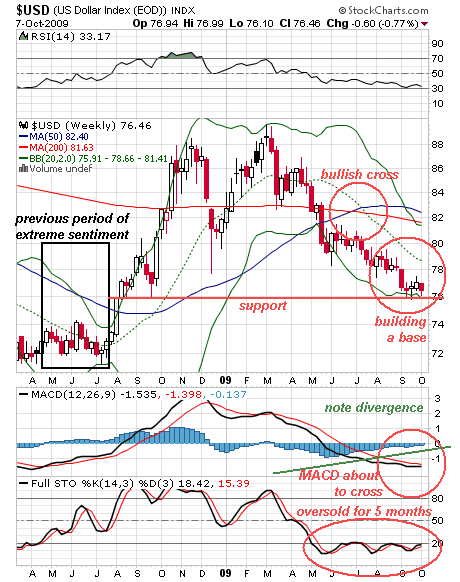 The dollar stumbled along for a miserable five months in 2008 (March – July) before reversing, and the stochastic has been oversold for the past five months. Negative sentiment also reached an extreme in the 2008 timeframe--and here we are again, with dollar bulls a nearly extinct species, limping along in the single digits (i.e. 91+% are bearish and 9-% are bullish). 1. Note the previous period of extreme negative sentiment. That 22% rally in the following four months works out to a 66% annualized return. 2. Note the divergence in the MACD and the strong possibility of a positive cross in MACD.